Wonderful, I had all these in my cabinet, completely untouched for the past ten months (I actually bought some Beetroot pills once). Without daring to look at the best before date, I popped the pills and got prepared for an interval session. My skin was tingling with all the beta alanine. This was psychologically reassuring – If it makes your skin tingle, it really must work! I went out for an interval session today with the best of intentions. But, it was just one of those days when it wasn’t really happening. The legs felt a little sluggish and rather than keeping up the power all the way to the top, I was keen to knock it off and end the interval early. With the additional threat of a looming dark cloud, I ended the session early, doing only half the number of what I managed a week ago. It was a bit of a blow for the ‘take supplements’ and you’ll go faster school. At least I didn’t feel so bad for forgetting to take anything for the past 12 months. Of course, it is maybe the case that supplements do work, but something else is skewing this off-one off test. Perhaps I was subconsciously worried about Hutchinson’s dire warnings of overtraining without having a coach to offer that detached overview to tell you to take some rest. A few weeks ago, I watched a BBC horizon programme ‘The Power of the Placebo‘. In the programme, cyclists were given a pill which they were told would do wonders for their performance. Except 50% of the test riders were given a placebo. The programme claimed that those on the placebo did as well, if not better than those on the caffeine pill. Often people on a placebo improved their times, despite doing that test a bit more tired. There must be something in the placebo effect, and it must relate to some psychological trigger. Perhaps this is the attraction of supplements. We need something to take which we think will make us go faster. However, I wasn’t quite as convinced with the Placebo as the programme makers were. They found 50% of cyclists went faster with a placebo, but 50% went slower or the same. Am I missing something or is that hardly conclusive evidence? The overwhelming problem of testing supplements, is that with so many variables, it is so difficult to provide reliable results. Even if a supplement works well for one person, there is no guarantee that it will work for you. It seems that scientific studies can prove the success of just about anything from taking no coffee to drinking 5 cups of coffee a day.The Anorak have the Daily Mail list of things which will give you cancer. If you try hard enough, you can seem to make a scientific study prove just about anything. 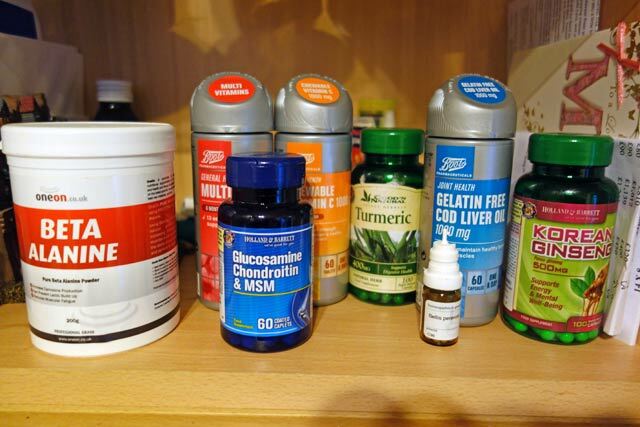 Given this overwhelming uncertainty about the effectiveness of supplements, what should the amateur rider do? Do we take absolutely everything known to man and hope that at least 1 out of the 50 supplements will makes us 1% faster. Or do we just throw the 3/4 full bottles in the bin and stick to marmalade sandwiches? I don’t know. So I’ll continue to muddle through, taking a few supplements every now and then, and buying a lot more than I actually take. One Response to Do supplements actually work?